The internet is full of resources, you need to find the right one. I found this post while I was searching for a good tutorial of GEE which I can use for my project. The context matched perfectly ! The script computes the difference between both images and then applies a smoothing filter to reduce the effect of the speckle noise. This means the author looked at Sentinel-1 before and after the flood that occurred around Grand Morin river at France during May 2016. The Radar images are great to study natural hazards and its impact because it can see through the cloud and capture images at any time of the year. Synthetic Aperture Radar or SAR sensors sends microwave signals and receives backscatters from the Earth surface which are later used to analyse surface characteristics. One key point here is that microwave cannot penetrate water, thats why waterbodies clearly stand out from the remaining land features. Thats why flooded areas can be easily identified by comparing two set of Sentinel-1 image, one before the flood, and one after the flood. Here is the source code. Yup, the code can be a lot cleaner. 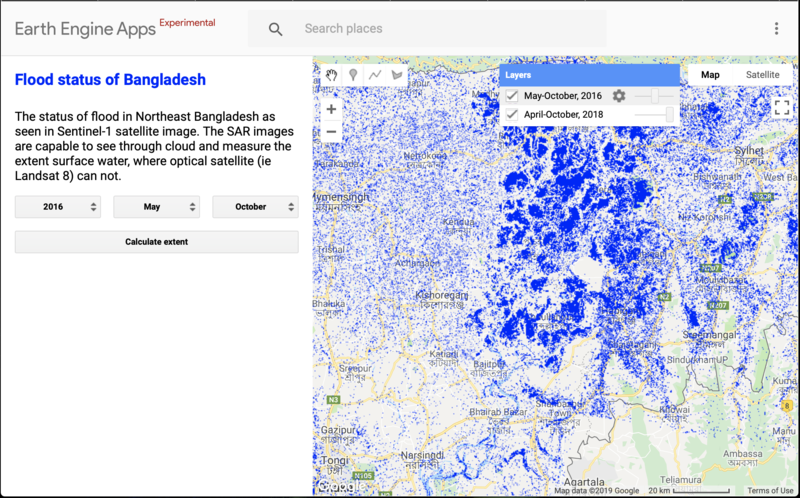 I took the liberty to use the source code and run it for Bangladesh. Moreover I changed a few more thing. Firstly, the before and after dates are stored as a variable so that I can create dropdown menus. Use these steps to create the API key and the app. Then a simple ui.Button took care of the remaining events. See the app here. The API documentation is here along with everything GEE has to offer, including the usage quotas.